And eating strawberry might be a necessity but transforming them into Strawberry Milkshake Cake with Whipped Cream Rosette is an art and sharing them with all is a noble job. Indeed! This is the exact story of a food blogger’s life; trust me! Most people cook for themselves; few cook for others but we food bloggers cook for living. Cooking is not a hobby for me; once it was my necessity and it’s my passion which pushes me further to go beyond my limitation to create new preparations or experiment with flavours. Many of us, food bloggers actually learn food photography & food styling in the half way of our journey but in my case photography is the fresh air in my life which helps me to breathe in daily chaos. I don’t go out without my camera though these days my daily commute partner has become the camera of my brand new mobile. These days I’m leaning over food photography to allure you people with all the deliciousness. Because in the end what matters most is the love and feedback from fellow readers. My food blog is more like a food journal of my life which is truly dedicated to the readers only. That’s why I keep coming back with seasonal recipes or occasional recipes or even traditional recipes. But sometimes I cook for my soul and name them creativity. Sometimes they become hit sometimes not but in my heart they remain as the most precious children and they will be, always! Today I’m sharing a bit ‘old wine in a new bottle’ kind of recipe. It’s Strawberry Milkshake Cake with Whipped Cream Rosette (to make perfect Rosette watch the video tutorial below). As the name suggests it’s a cake, a milkshake and an ice cream too! Confusing? Let me clear the air for you. Strawberry Milkshake Cake is milk rich cake (and I pretend like it’s the protein &calcium rich extremely healthy one, you can think whichever your mind suggest, done?) which tastes just like strawberry milkshake but in a slice of cake. In other words a delicious makeover of regular Strawberry Cake with strawberry ice-cream flavoured Icing. You can say it’s a nostalgic tribute to those childhood memories of summer days with decadent Strawberry Milkshake & Strawberry Ice-cream. You must be still wondering, ‘But why Milkshake Cake’? Well this super moist cake looks smells and tastes just like real strawberry milkshake. It is not only loaded with milk and fresh strawberries but even the frosting also tastes like strawberry ice-cream.. So now you know the story! It’s a tall four tier cake with strawberry milkshake flavoured sponge, vanilla cream filling, strawberry flavoured frosting and some strawberry flavoured rosette on top. I wanted my cake to be light textured and lactose free (I’m the intolerant one here, weep weep) so I used dairy free whipped cream (soy) and mixed vanilla and strawberry flavours. Strawberry flavoured Buttercream can also be used for the same if you are fine with it. And top of all I tried my level best to give it a look of a glass of strawberry milkshake with whipped cream on top. 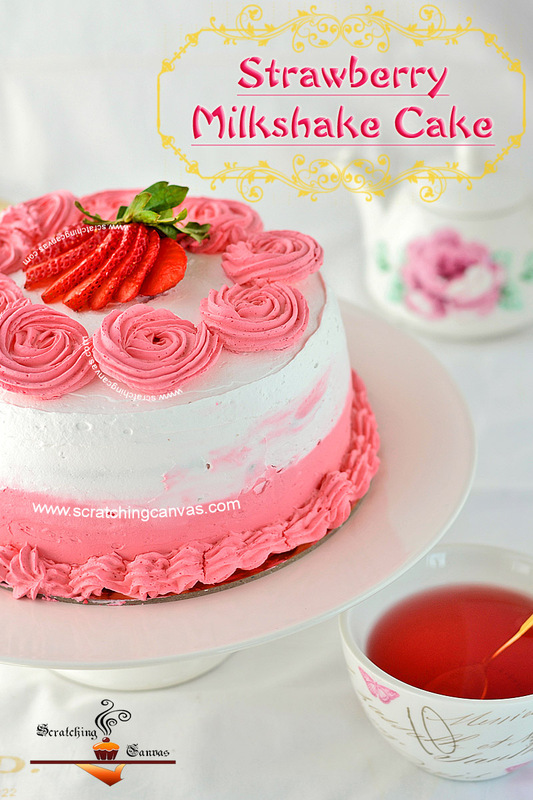 Here is my elaborate step by step recipe of Strawberry Milkshake Cake with Whipped Cream Rosette for you all. To make perfect Rosette don’t forget to watch the video tutorial below. Do make sure all ingredients are at room temperature (unless mentioned) and weighted or measured correctly in appropriate weighing scale or measuring instruments such as cups or spoons. Remember these are not our regular cups or spoons which we use in our daily life. If you are baking this cake for a smaller group of people, reduce the amount of the ingredients to half which will make one 6” round cake with two thin layers; around 2” to 2.5” tall or one 8” round single layer cake. Watch my quick step by step video recipe of No Bake Skillet Cake with Peach and Butter milk without any Oven. Before starting the prep work, one should keep one thing in mind that this is a large four tier cake with quite a lengthy process. So one has to be patient and organized; otherwise entire hard work will end up in a big fat mess. Let’s begin with greasing and dusting of the baking pan. Next is preparing the actual strawberry milkshake. Take chopped strawberries in a blender or food processor and make puree of them without any additional water. Puree should be dense and smooth. Then pour milk into the strawberry puree and blend. Voila Strawberry Milkshake is ready! Move on with the wet ingredient. Add egg and continue whisking. Take care not to overbeat. My batter was nowhere near pink so I mixed 3 drops of pink food color in to 1/4 cup of milk and added this to the cake batter. But this is completely optional step; if you don’t want to add food coloring, just skip it. Distribute cake batter equally into two 6” round baking pan. Life is tough so do baking a cake. One of the trickiest parts of making tier cake is distributing the cake batter evenly in all cake pans so the tiers can have even look. And I’ve found it’s easier to pour mixture in pan on top of weighing scale to distribute batter equally by weight. Now comes the baking part. Or if you have a small oven like me, bake two cakes separately. Bake each cake in preheated (1600C) oven for 30-35 mins at 1600C; then, lower the temperature to 1400C and bake for another 10-15 mins (depending on your oven) or until a skewer comes out with clean crumbs when inserted in the middle of the cake. (See Notes) The sponge should bounce back when touched. While the cake is resting, prepare the whipped cream Frosting and Filling. Place one top layer of a cake on cake drum and pipe soft peak whipping cream on it to cover the surface. Or you can dump 1/3 of the whipped cream with soft peak and spread evenly with spatula. But trust me using piping bag is an intelligent idea to keep kitchen counter clean mess-free. For the final frosting dump the pink frosting on the lower side (or upper or on entire cake whichever you prefer) and level them with the spatula. Frosting looks good in either elegantly smooth or in rustic rough way. So pick your choice and do it. As it was a wedding cake I tried to give it classic smooth look. Your cake is good to go like this only. But if you want to decorate it more go ahead and flaunt your creativity. I piped few pink rosette around the around the edge of the cake and place sliced strawberry in the middle. To make perfect Rosette watch the video tutorial above. Strawberry Milkshake Cake with Whipped Cream Rosette is all set to turn the heads in the party. Make sure to dip the knife in water or wipe out with clean tissue just before slicing the cake and serve immediately. Thus the frosting will be intact with each slice. To enhance the strawberry experience, serve the cake with a cup of strawberry tea or with dollop of cream and fresh strawberries. This cake is huge and perfectly capable to satisfy 8-10 persons. Excess cake can be refrigerated in airtight container. Cake will be moist and taste will be good upto 4-5 days. 1. Vegan version: Replace the egg with egg substitute or yogurt or apple sauce or mashed banana. 2. Use regular milk or coconut milk or almond milk even buttermilk instead of soy milk. 3. Use any other firm fruit like apple or plum instead of strawberry; just make sure fruit is not too watery. 4. Use any other flavors or color you feel right for your cake. 2. I always use regular salted margarine but my mother never use anything but while butter without salt. 3. Any other flavored milk or dairy free milk will also work fine. In fact strawberry milk will add stronger impact to the cake. 3. Greasing and dusting the baking pan will make sure that cake won’t stick to it while baking. 4. Sifting and resifting the dry ingredients will make sure puffy and light cake while baking. 5. Don’t overbeat the butter & sugar. This will yield grainy texture and cake won’t be as fluffy as expected. 6. Always powder your sugar before start baking. There is no harm in using granulated sugar but it will take more time to incorporate all the ingredients while mixing which often produces curdled mixture, resulting dense heavy chewy cake, not light and aery, the way we love our cakes. 7. Mix flour with other ingredients in shape of ‘8’; be slow be gentle. Mixture can be over mixed in a jiffy which can produce hard dense cake. 6. Don’t pour the entire flour and milk together at one go, it will be hard to mix and also mixture will turn into a lumpy form. It is preferable to maintain the ratio for a smoother result without any over beating. 12. Keep the whipped cream in clean & dry glass bowl and cover it with cling film until needed. Remember, less air contact means better taste. 14. While spreading the filling between layers, remember to leave ½” on the sides. When the layers will be done, filling will be spread automatically by the pressure. What a gorgeous looking cake. Strawberries are put to their best use ! Too tempting !